Glass vessels were ubiquitous in the Roman world and in the Roman house, where they served a variety of functions and could be found in diverse settings, from the dressing table to the kitchen. The objects in the “Everyday Dining” section of The Roman House at Hopkins were mass-produced and used for eating and drinking. While it may seem that these vessels are commonplace, they are the result of technical and historical events that swept through the Roman Empire at the turn of the millennium. Although glass production began nearly 4,000 years ago in Ancient Mesopotamia and Egypt, the invention of glass blowing did not occur until the first century BCE during the Roman period. Inflating and shaping molten glass with an iron rod proved to be a faster and more flexible method of producing glass vessels than earlier techniques. Also at this time, Rome began to shift from a republic to empire under the leadership of Julius Caesar. The Emperor Augustus, as Caesar’s nephew and heir, worked to consolidate Roman hegemony throughout the Mediterranean until his death in 14 CE. Safe and quick transport routes throughout the Roman Empire resulted from the political stability afforded by Augustus’ rule. According to the Greek historian Strabo, by the 1st century CE a glass vessel could be bought for “a copper coin” and became a standard household item (Geography XVI.2). The glass vessels in this group are representative of what may have been found in a typical Roman house, both in their shape and decoration. With the invention of glass blowing, craftsmen broke away from traditional shapes found in ceramic or metal that served as prototypes for early glass vessels. While some shapes, such as dishes, bowls and plates are familiar to us, others were very specific to Roman tastes. Beakers, two examples of which can be found in this group (HT 142 and 867), did not appear before the Roman period. They were used either as drinking vessels or containers for various food and ointments. Often times their openings were covered by cloth or leather and tied closed at the taper below the rim. Glass trullae, or “pans,” as exemplified by HT 228 , were also unique to the Roman world and were used for either drinking or pouring libations. 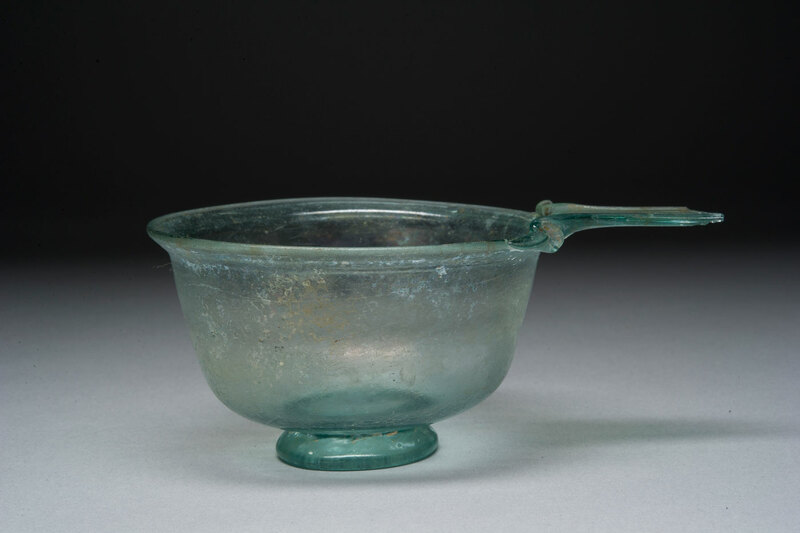 Glass appealed to the Roman consumer not just for its utility, but also for its aesthetic quality. Glass blowing allowed vessels to appear remarkably transparent. This characteristic, previously limited to elements of the natural world such as water, or tremendously expensive materials like rock crystal, must have seemed almost supernatural to the viewer. The Roman philosopher Seneca asserts: “Apples seem more beautiful if they are floating in glass.” (Investigations in Natural Science I.6). Glass blowers used color and decorative motifs to enhance the inherent beauty of the material. Unadorned vessels for quotidian use were left in their natural greenish-blue color, as seen in a majority of vessels in this exhibition. However, simple mineral additives could be mixed with the molten glass, resulting in brilliant colors, as exemplified by the cobalt blue tray (HT 691). Detail from the Cubiculum (bedroom) from the Villa of P. Fannius Synistor at Boscoreale. The Metropolitan Museum of Art, Rogers Fund, 1903 (03.14.13a-g). Image reproduced courtesy of the Metropolitan Museum of Art. Glass blowers often used new decorative techniques, such as trailing, in which they added a thin line of molten glass to the surface of a vessel. This can be seen on the beaker with a bright blue “trail” (HT 142). Two other objects, a dish and a bowl (9163 and HT 232), have applied trails as their handles. The malleability of glass, in comparison to metal or clay, led to the creation of new forms such as the indented beaker (867). This decorative motif was also functional, as it allowed the owner to pick up the beaker more easily. 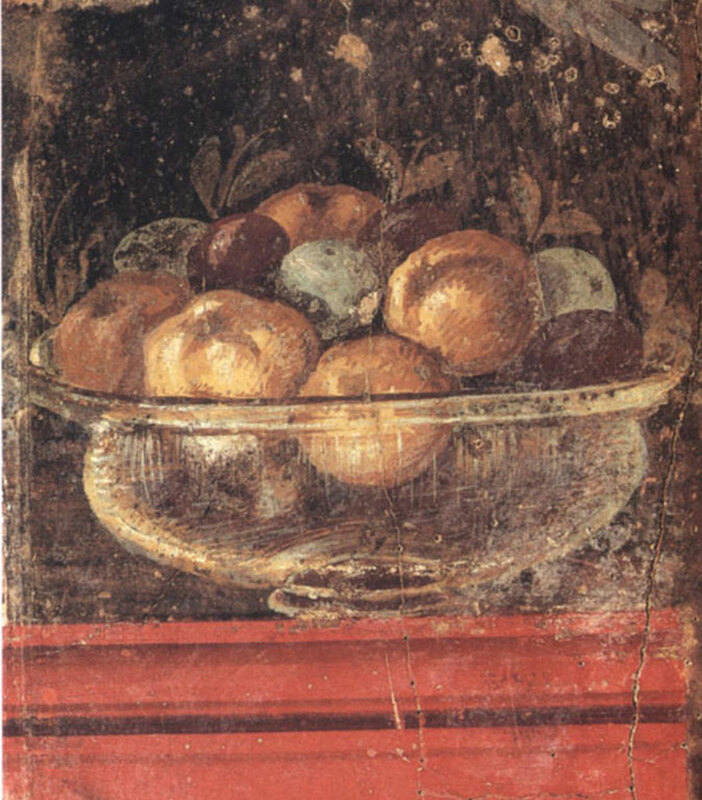 Glass vessels were even illustrated on frescoes in the Roman house, as in the example from the cubiculum of P. Fannius Synistor from near Pompeii. The glass in this exhibition is representative of a dynamic era, the Roman Empire, when technological innovation and historical change allowed a vessel formed in Syria or Israel to end up on the dining table of a Roman villa in Switzerland.